Digital outlets lack the clout of traditional media when it comes to covering the intricate world of finance, according to a study from Gorkana. NEW YORK: US-based financial journalists say traditional media, not digital outlets, are the most influential in terms of Wall Street coverage, according to a study released on Wednesday by Gorkana. 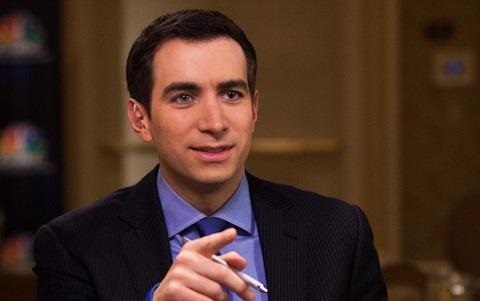 Nearly one-quarter (23.7%) of respondents rated Andrew Ross Sorkin of The New York Times and CNBC as the top financial journalist, according to the 2015 Gorkana Financial Journalists Survey, conducted in partnership with professors Matt Ragas and Hai Tran of DePaul University. This is the third straight year Sorkin has finished first. Rounding out the top five are The Wall Street Journal’s Jon Hilsenrath, The Times’ Gretchen Morgenson, author and Vanity Fair contributor Michael Lewis, and Jim Cramer of CNBC and The Street. Lewis jumped from a joint fifth last year to a tie for third place with Morgenson in 2015, boosted by the release of his book "Flash Boys: A Wall Street Revolt," according to the study. Cramer was up three places compared with 2014. 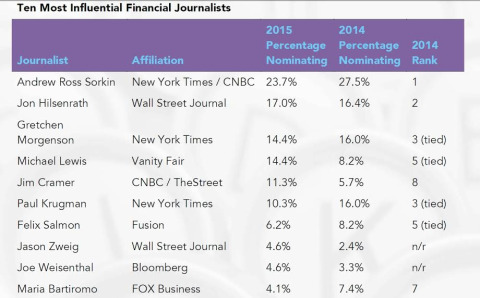 The Wall Street Journal led the pack of most influential media outlets, nominated by 85.4% of respondents. Bloomberg News, The New York Times, The Financial Times, and CNBC rounded out the top five. However, a number of well-known financial media were not mentioned enough by respondents to make the top 10, including Business Insider, MarketWatch, and CNNMoney.com. "It was a little striking that there weren’t more digital-only or online-only business outlets on the list," said Ragas. More respondents than last year also nominated Twitter as an influential media outlet, even though it is considered a social networking platform, he pointed out. Some respondents also specifically nominated the Times’ DealBook section. "As PR pros, we need to know who, within the media ecosystem of business news, financial journalists believe is setting the agenda in terms of publications as well as journalists," Ragas explained. "It is important when monitoring media to follow these outlets and professionals and understand that other financial journalists might be looking to them in terms of trends and story ideas, because there is a follow-the-leader type of effect. 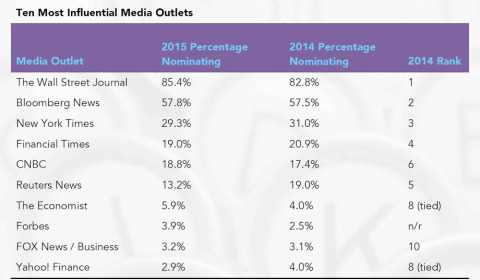 The 2015 Gorkana Financial Journalists Survey was conducted in March.